An eye for detail is essential when decorating the home. You can nail the paints used for your home, the lighting for the rooms, the layout of the furniture and have a welcoming and warm abode, but if you want it to be memorable to the point that guests will still be talking about weeks, months, and even years after their visit, no detail, no matter how small, can be overlooked. It’s particularly crucial for you not to miss anything when it comes time to decorate your dining area. After all, this is the place you and your guests will likely spend the most time whenever you have them over. Impressions last and if you aim to impress, then even the fine details matter. You may not have paid that much attention to them in the past, but your dining chairs are important design elements of your home. Modern dining chairs are even more important now as the good ones add impeccable style while providing great comfort in any room they are placed. If it’s your goal to showcase a home that is beautiful down to every detail, then you need to pay attention to your choice of dining chairs. The first thing you have to do prior to getting a new dining chair is to visualize how it will actually fit into your living or dining room. Check for clashing colors, awkward design fits, and any other issues that could make a chair stick out like a sore thumb in your dining room. Also remember to consider comfort when selecting your chair because it’s hard to enjoy dinner when even just sitting down is a challenge. Think about material compositions too, as they bring different features to the table, and lastly, be prepared to see prices ranging from around $60 to $200 while shopping. The feature of Poly and Bark’s Birds Nest Dining Side Chair that will really stick with you is its appearance. It’s not understated by any means and that can be a double-edged sword. That said, if your aim is to be bold with your design and you want show-stopping pieces in your dining room, then this chair is a fine choice. The chair itself is made out of molded plastic so you can expect it to be quite durable. The eye-catching look of this particular chair also adds a lively quality to your dining area that not every modern piece out there possesses. The material composition of this particular dining chair means that it can be used either indoors or outdoors. This chair is also stackable and if you happen to have a smaller home or lack storage space, you will appreciate this chair. Some assembly is required, so you may need some help if you’re not particularly handy. The seat portion of the chair itself is on the shorter side, meaning taller guests may be a bit uncomfortable sitting on one. Eiffel Style Chairs look like they could have been pulled right out of a movie set and placed in your dining room because of their distinct design. The sides of the cradle itself are elevated, serving almost like armrests, but they won’t make you feel as though you’re movement is restricted. The plastic used to make this chair is also easy to clean, and that comes in really handy, because no matter how careful everyone is, accidents are bound to happen around food and things could get messy. 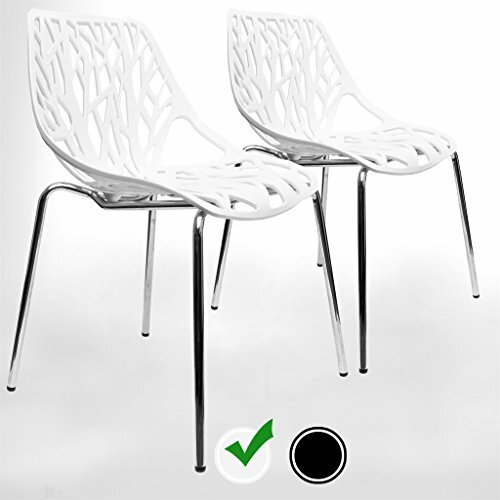 Aside from being easy to clean, the plastic material used for this chair is also very durable. The legs of this chair have been outfitted with special rubber rings that are designed not just for eliminating those annoying screeching noises, but also for protecting your floor. The deep seat could turn into something to contend with when it comes time to reach for items on the table. Because of the way the base of the chair is designed and the way the cradle is elevated from the ground, it may be difficult for you to get comfortable right away. Simplicity, when it’s done right, remains stunning in a special kind of way. 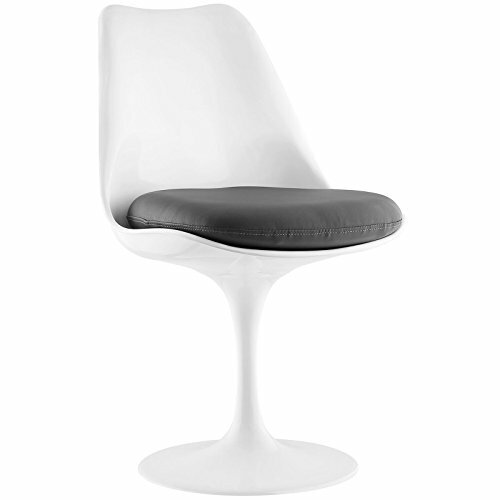 UrbanMod’s Mid Century Modern Style Chairs aim for capturing the essence of beautiful simplicity, and they succeed. The cradle of the chair is ergonomically designed, allowing it to provide adequate comfort, even while the dinner party lasts long into the night. It’s another chair that features plastic composition, though just as in the ones reviewed earlier, the material here adds durability. Plus, though it may not look like it, this UrbanMod chair is also capable of supporting weight of up to 330 lbs. The way the cradle is designed will align perfectly with your lower back and that results in exceptional comfort being provided. The chair is set at a height where reaching the dining table and the items on it should not be an issue. There is some assembly required, so you’ll have to set aside time for that. This chair is designed in a way that makes it a solid supplemental piece, but not necessarily as a show piece. Comfort doesn’t have to come at the cost of style and Coavas’ Kitchen Dining Chairs are the embodiments of that. These chairs feature fabric cushions that are designed to gently cradle a person’s body as they settle in for a long meal. Another notable feature of the chair is its ergonomic design. Thanks to the presence of the fabric cushion and the use of the ergonomic design, there really is no need to worry that spending too much time sitting on this chair can lead to back pain or anything similar. Rubber rings are used for these chairs, and they are there to make sure that your floors don’t get all scuffed up. Because of how comfortable, these chairs can also be used in home offices and other places where sitting for a while is necessary. Assembly is required, so make sure not to lose any of those important pieces. 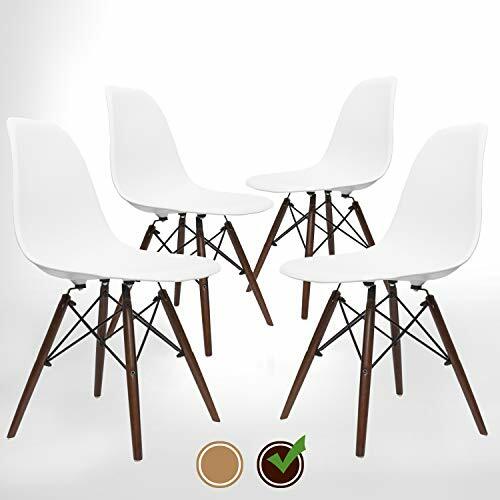 These chairs can still support plenty of weight, but not as much as some of the other modern dining chairs that are also available. Armchairs bring their own distinct style to the party, and if you’re in the market for one, the Modway Aegis Dining Armchair is worth a look. Though it will likely be mostly used in the dining room, this chair from Modway can be taken into any part of the home and still look perfectly in place. You can snuggle up to the textured twill fabric covering the chair while resting your legs against the arms if you want. The addition of padded foam will ensure that your guests will have a tough time leaving the comforts of this chair even when dinner is over. Tapered wooden legs are the finishing touches to an already exquisitely designed chair. This chair can comfortably support up to 310 lbs. The armrests and dimensions of the chair may take up quite a bit of space in the dining room. Eat carefully as cleaning that twill fabric could take some time. There’s no need to be worried about lacking bold style in your dining room if you have Modway’s Lippa Chair. 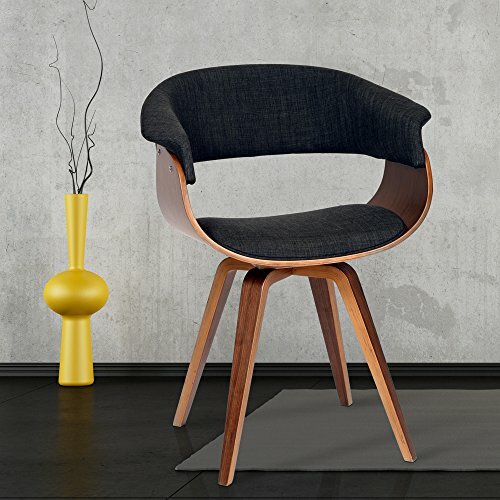 The ultra-modern, minimalist design of the Lippa Chair is not for everyone, but if you’ve long been on the lookout for that one item that will embody your forward-looking sense of style, then this would make for a wise purchase. The chair features three main components, with those being the cushion that is meant to keep you comfy, the stylish plastic frame, and the aluminum base that provides stability. The ability to turn in any direction is a neat little feature of this chair, and it’s one that is most welcome when trying to encourage conversation among guests. Varied color options for the cushions allow you to find the right for your home. It remains important to keep watch for stray pieces of food as you don’t want those cushions getting dirty. The exact look of this chair is not for everyone. How daring are you when it comes to design? Well, you’re opinion of Armen Living’s Summer Chair could offer some clues. The cradle of the chair will be able to seat you comfortably, and the two cushions are there for added comfort. The upholstered fabric feels comfortable to the touch and the wood finish brings an additional bit of elegance to the chair that is more than welcome. 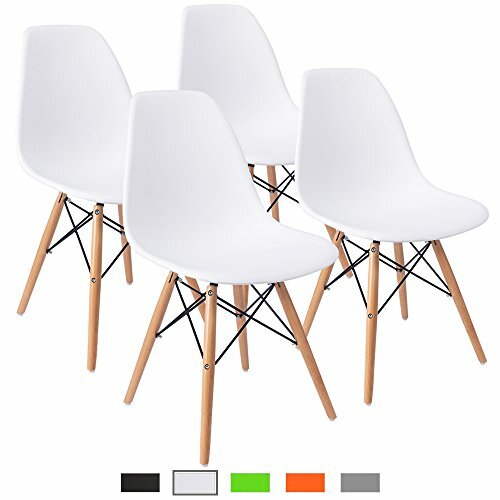 It is one of the most unique-looking design chairs out there, so get it if you want a stand-out piece in your dining room. Additional color options give you the chance to find an ideal fit for your home. Other chairs available on the market are capable of supporting more weight. The lower back portion of the chair lacking could be an issue for some people. 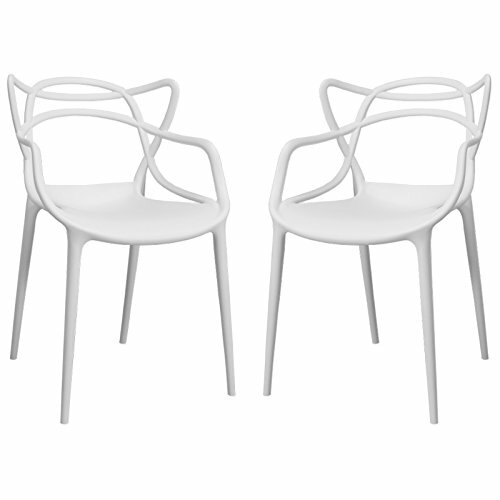 UrbanMod’s Birch Chairs share design similarities to the Poly and Bark Birds Nest Chairs mentioned earlier. A nature-inspired pattern is the most distinctive aesthetic feature of this chair. The distinct patterns can break up otherwise dull dining room arrangements. The cradle is made out of high qualityplastic, while the legs are crafted out of stainless steel. 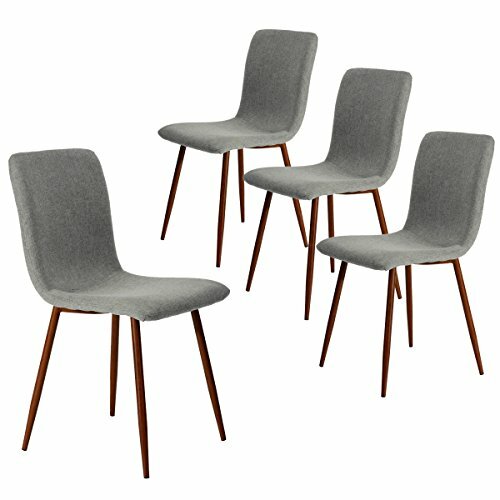 Saving up on space is easier with these dining room chairs because they can be stacked on top of one another. 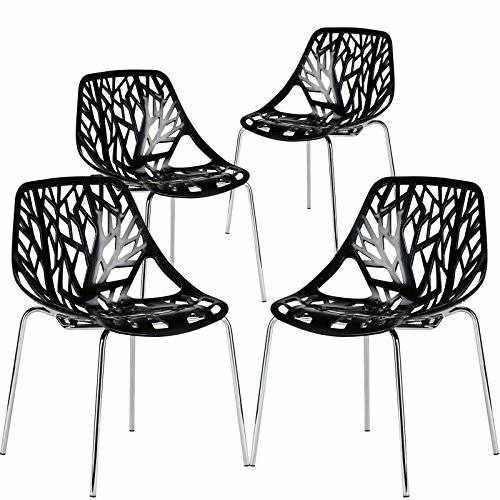 The tree designs combined with the white color turn these chairs into Christmas décor options. The lack of cushions causes the comfort rating of this chair to take a bit of a hit. Modern design features its fair share of visually striking patterns, and some of them can be seen in the Loop Chair from Mod Made. The looping patterns create this illusion that will intrigue at first sight, but don’t worry, they’re not just for the eyes. Resting your back on this chair is a comfortable experience as well. The Loop Chair is made out of plastic. Different colors are available so find the ones that will work best inside your dining room. The plastic material that makes up this chair is what also allows for it to be used indoors and outdoors without worrying about damage being sustained. These chairs are also stackable, so you have the option of storing them easily if they are not in use. The chair could probably benefit from just being a bit higher. The plastic used for this chair is not the most stylish-looking material. 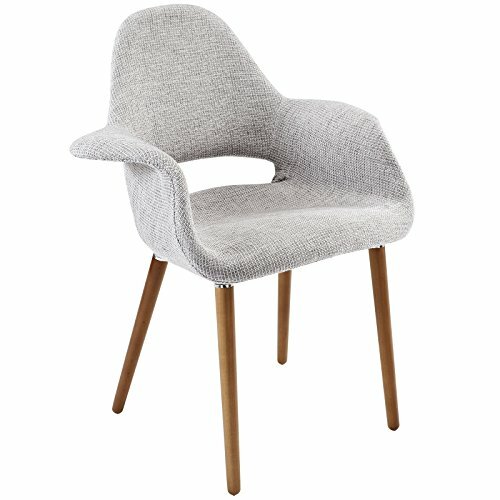 Last but not least is the Casper Chair from Modway and to say it has a unique design would be quite the understatement. 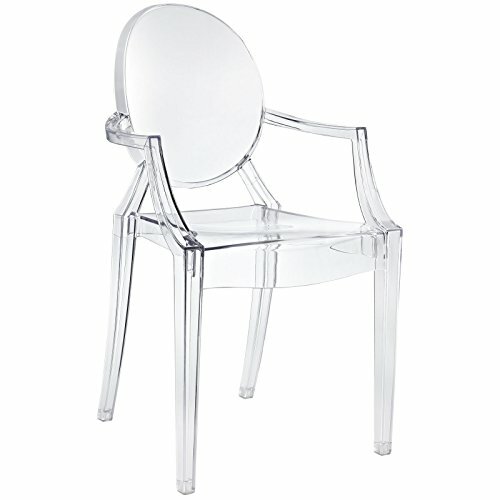 Taking a cue from everyone’s favorite friendly ghost, the Casper Chair’s most eye-catching quality is that it’s transparent. Pair it with a glass dining table and you can create one heck of an illusion in your dining room. The polycarbonate composition of the Casper Chair bestows upon it a durable quality that may not be immediately evident because of the distinct appearance this item features. The Casper Chair is good to use inside and outside the home, and the sight of raindrops falling on it is quite spectacular. Despite how it looks, the Casper Chair is actually quite strong and is capable of supporting up to 330 lbs. You’ll need to get the lighting right to make the most out of this chair’s design. Probably not a good idea to keep rushing around the dining room or you may keep bumping into this chair.